Unfortunately, heart disease still remains the number one killer in America, even though many of its risk factors are preventable. Not smoking, reducing stress, eating well, regular exercise, maintaining a healthy weight, and watching your cholesterol and blood pressure are all some preventable ways you can reduce your risk of heart disease. 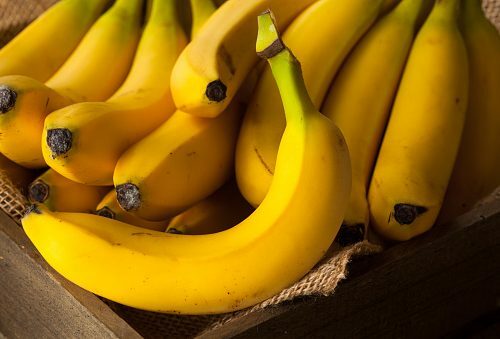 Specific to diet and eating well, researchers suggest that consuming potassium-rich foods like bananas may help reduce the risk of heart disease. Researchers from the University of Alabama at Birmingham looked at mice potassium levels and uncovered that reducing potassium levels through diet contributes to the formation of vascular calcification and aortic stiffness—hardening of the arteries. When arteries become hard, blood pressure increases, as does damage to artery walls, which are all contributing factors to heart disease. The researchers found a hardening of the arteries to be higher among mice that consumed a low-potassium diet compared to mice that consumed more potassium. Additionally, the researchers found that too little potassium seems to promote expression of certain gene markers, which in turn promotes vascular calcification. This led the researchers to conclude that reduced potassium intake could promote aortic stiffness and therefore, increasing potassium could promote healthy arteries. Potassium is an essential mineral as it plays a role in many bodily functions such as maintaining healthy blood pressure, muscle growth, and brain and nervous system function. As with anything in life, moderation is key, and so even though potassium is necessary and offers benefits, taking in more than what is required won’t make you any healthier. In fact, it may make you quite sick. The recommended daily intake of potassium is 4,700 milligrams, and many Americans only consume around half of that. One medium banana only contains 422.4 mg of potassium, so you have room in your diet to add in more. You may think that you can just supplement your daily intake of potassium, but as with any nutrient, your body absorbs it in greater quantities when ingested through food. Related: How does potassium lower blood pressure?